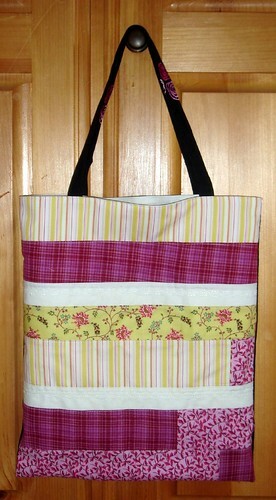 More totes, in preparation of the upcoming craft shows. Very similar to the bags posted already, just different fabrics. OK... C., the teenager, took the pictures of one set of bags and I took the pictures of the other set. Can you tell who took which? Of course C. took the cool wonky free-spirited ones ... and I took the dull straight-up-and-done to the point, leave nothing to the imagination ones. I love the ones she took, so imaginiative and carefree, and so much more playful. Speaking of the beautiful talented C., she's back to being home schooled. Jason and I were disappointed in the public school high school experience and pulled her out a few weeks ago. It was a fairly spur-of-the-moment decision, it wasn't long ago that I mentioned that we'd let her ride out the year in public school, but this was the right decision. She's disappointed, she really liked the friends she was making, but is handling it all very maturely. We're so happy to have her around and love the positive change in the family dynamics brought about by this change. And now, completely unrelated to C., I could use some input. My two youngest boys share a room and aren't getting any sleep. They've shared a room for years, so that's not new, but suddenly they're being awful at bedtime and in the morning ... lots of getting out of bed, playing, misbehaving, arguing, fighting, etc. for 1+ hours after bedtime and 1+ hours before we get want to get up in the morning. They're both exhausted ... which shows all day long, of course. I've got to get them back on track sleepwise ... and I'd rather not put them in different rooms if I can help it. Any ideas?? Those totes are SO cute! I love the fresh colors. And congrats on making the decision re. high school and C. She seems like such a gifted girl; I can definitely understand how much of a blessing it is to have her around. I know I would miss my kids terribly if they were gone all day...I'd hardly know them at all, I think! I'll lyk if I come up with anything better! 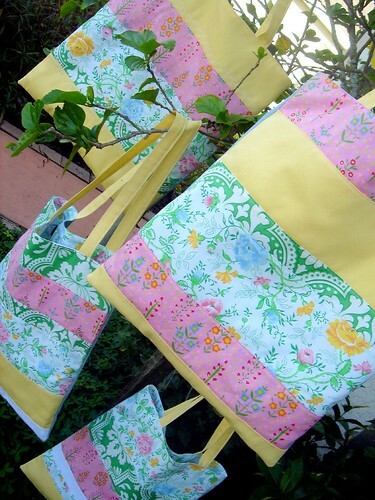 The totes are gorgeous - and I love the pictures that C took too! So adorable. Makes me want spring to be here now!